Tip: Pets do not run away; they run around and get lost. so it's important to cover all the bases. In this section are many important details that are easily overlooked. Some information in this report is painful to read and difficult to cope with. Plan for a thorough and efficient search; it can take weeks or months to find the lost. Compare this information with how long your pet has been gone, his size, his speed, his condition. Is he larger, and can he run faster and longer than a small pet? How far could he be from home right now? Will he run in a straight line, or hole up somewhere near home? To verify for yourself how fast a pet can travel, simply call three veterinarians whom you trust and ask: "How fast do you feel a pet such as a small dog or cat can travel, hour after hour if necessary?" or "How fast do you believe a large animal such as a German Shepherd can trot indefinitely?" and "How long is 'indefinitely'?" You may get three different responses to each question, but this can help you reach your own conclusions as to speed and distance. Although it is highly unlikely your pet will be taken in permanently by a neighbor (also see neighbor lost pets statistics at Section I, item H), if some kind person is helping, what will that neighborly person do with a lost pet they have found? 1. Someone may take him in and keep him indefinitely. or more, and then dump him or give him away. 3. They may keep him locally, or transport him elsewhere. acquaintances immediately who may do any or all of the above. either right away, or weeks or months from now. 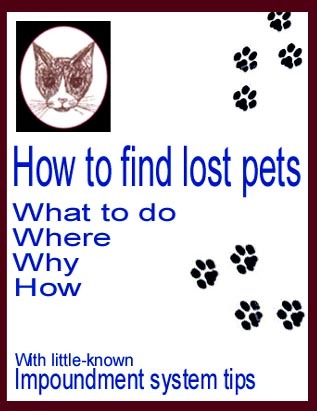 C. WHERE LOST PETS GO INITIALLY. (We'll cover other issues and transported pets later). Although not always true, when lost and on his own, a dog tends to roam, sometimes in circles, sometimes in rather straight lines. A cat on the other hand, will tend to run/hide, run/hide, until he finds a safe spot in which to hole up that is not already occupied by a tough opponent, a spot which is dry, and one which offers some protection from the elements. In inclement weather, a dog will also need to find shelter. If the lost pet gets kicked out of his shelter by a human or by another animal, he again must search until he lucks out and finds another safe and sheltered hideout. This effort for the pet is complicated by the fact that most cities require property owners to keep their homes and outbuildings in proper repair, meaning no holes, no loosely-hanging doors, and meaning porches must be closed-in to keep varmints from living under them. Where is a lost pet going to go if there are no openings in any garages or other out-buildings? If the pet finds an accessible building, will that building have a cozy warm spot for sleeping, with bedding and with body-sized "roof and sides" to help hold in body heat during cold months? Many fenced-in yards have closed gates; if your cat or dog finds an unoccupied dog house, will a gate block his way, and if not, will there be bedding in the doghouse to aid in survival? a) Neighbors, “friends” and family members have been known to “get rid of” pets they see as aggravating, dropping them off away from home. b) Cats and dogs have been known to sneak into cars or trunks and then run when the door is opened … miles from home. c) Even a small dog or cat can lope indefinitely at 3 miles per hour … meaning in only 8 hours, that animal could be 24 miles away. And most pets lose their sense of direction easily, once a short ways from home. d) Some municipalities contract their animal control whose wardens pick up and transport pets many miles away from home to another area’s facility, sometimes crossing through various other impoundment areas. D. LOST PET BEHAVIORS. Each animal is different, and animals when on their own typically do not behave as owners believe they will. For example, with most pets not being bloodhounds, they lose their sense of direction easily once a short ways from home. Animals that are lost for a considerable period and then suddenly show up at home are not the norm -- and finding home in this manner does not in any way mean the animal always knows where home is, nor that each missing animal will "come home when it wants to". Pets do not want to be lost, frightened, hungry, thirsty, way hot, or way cold, or struggling for survival any more than you or I or a little toddler would want to. Lost pets want to be home and they normally need help to get there. Although many people see domestic pets as being perfectly capable of taking care of themselves, this writer does not. When you think about it, can a cat or dog go shopping for food? Can it create a heated or cooled home for itself? Can it reason through exactly why or why not to cross a street -- and does its instinct allow it to not chase that squirrel running under a moving vehicle? When a pet is lost, can it read a road map? Of course not. So this writer chooses to view a domestic pet's mentality as being much more similar to that of a very young human toddler, where adult control is required in order to provide safety and security. Just as each animal is different, each circumstance is also truly different. For example, if a dog or cat is dumped or jumps out of a vehicle in an unfamiliar area, they will often attempt to hang around in that area waiting for their owner, waiting for a week or more even in awful circumstances. If weather is bad or no food or water are available, they may have no choice but to run and search for shelter and food. If the pet runs in one direction, he might accidentally find home; if he runs in another direction, he'll simply get even more lost. Intact males and females: During mating season(s), intact males and females will often disappear for days or week(s) at a time. This is especially true with males (since females will want to be home once they've become pregnant). During the season, neighbors will be forced to put up with yowling and screaming during intense catfights and copulation. The cats are subjected to more dangers, since they are so engrossed in chasing each other around, they are less likely to notice approaching vehicles or other hazards. If they survive the hunger, thirst, and other perils while on their own, then they must later attempt to get a handle on where home went. Frequently they fail to find home, and are left to fend for themselves on the streets. Keep in mind that cats are more likely to hole up in the general neighborhood of loss (assuming they have not been carried elsewhere, and assuming they have not been chased). Cats revert to wild tendencies easily due to ongoing fear for safety. See Section IV,E,4,j "Cats Tip" regarding using a humane live trap. Once a pet is lost, he is frightened, hungry, confused, disoriented. As such, he may or may not behave as you are accustomed to seeing him do. Your much-loved long-term friend may even run from you if you see him. It's not that he has forgotten you, he has just reverted to survival mode, in which he can no longer -- at the moment -- be certain of who is a friend vs who is out to get him. Please exercise patience. On the other hand, if your lost pet comes racing up to you all excited and jumping for joy, that does not in any way mean he's been having a good time on his own. He's just overjoyed, relieved, delighted to see you again, and anxious to get home to food, comfort, and safety. As a truly lost pet -- one who has been gone long enough to realize he doesn't know where home is -- he's been to hell and back. E. GETTING TRAPPED. It is possible your pet may get into a garage or outbuilding or vacant home through an opening of some sort, or may crawl under a home through a construction cleanout or loose board-in … and then get snowed in or boarded in and unable to get out. With dogs, there will be barking. Some cats will meow loudly, but others have very soft voices even when in trouble. It is important to make sure your posters ask people to check their outbuildings and vacant neighborhood buildings and to continue keeping an ear open for muffled barks, whines, scratches, or meows. Be sure to ask people you speak with to remain conscious of this issue and to notify you if they think your pet might be trapped. F. WHEN LOST AWAY FROM HOME. If your pet jumped out of your car, or ran off when you were visiting somewhere, the most-likely thing is that he will hang around in the area and wait for you to find him. We have heard stories of such pets (cats and dogs) waiting for as long as two weeks for the owner to show up -- in a vacant lot, in a wooded park, in a swamp, in or near a vacant building, at a truck stop. Much longer than two weeks is possible if the animal has found a source of water and/or food. The fact is, these little guys don't just disappear when you can't find them. They are likely there somewhere, waiting. Also, be aware that as long as pets receive adequate food, water, shelter, and receive the right kind of security, attention and affection for their particular needs, pets never ever "run away", which implies something they do on purpose. On the contrary, pets on the loose simply run around and get lost. On occasion, stories are told about pets who are constantly wandering over to and staying at a neighbor's house. This is a solid indication that something important is missing in the animal's life. Security, perhaps. An example situation might be this: Perhaps your pet spends much of its outdoor time on a neighbor's porch instead of yours. Perhaps your pet prefers being there simply because that owner uses that door more than you use yours where the activity, sounds, and closeness to the people are all inviting to the pet; maybe the sounds of people inside travel more easily out to the neighbor's porch, perhaps there is a room adjoining the porch in which the neighbor spends more time, or maybe your neighbor leaves enticing food out knowing that pets love to have food in front of them 24/7. Whatever your own pet's reasons might be, to prevent any of your pets from wandering, please neuter/spay, and be sure to keep them all -- both cats and dogs -- lovingly, humanely, and safely confined. 1. Purposeful Transport. A caring person may find the animal, assume it's a stray, take it home hoping to find the owner, but then the animal accidentally gets loose. Or the caring person may bring the stray across town or across a metro area to a distant pound or shelter which is the only one that person knows about. We have also heard from people who lost pets which were gotten rid of by someone else. One example was a "friend" who dumped a cat across the city as a joke, another where an irate spouse brought a beloved family dog to a pound more than 12 miles from home, leaving everyone else to worry and wonder what had happened to it; and yet another where a "friend" again dumped a cat in a distant neighborhood. One of these cats was recovered, due to an intensive week-long search. The other, the owner did not search for at all. The dog was recovered by the grieving spouse who received an anonymous call from a pound visitor. 2. Accidental Transport. Cats and dogs have been known to sneak into vehicles or trunks and then run when the door is opened … sometimes miles from home. 3. Transport by Animal Warden. Sometimes contracted animal wardens will transport pets many miles away from home, crossing through one or more other impoundment areas, across city or county lines, to a distant facility where the animals will be impounded. Review Section III to see why Animal Warden transport happens. Review Section IV for more info on why and how Animal Warden transport happens. H. GETTING HOME ALONE. Of course there's always a chance that your lost pet could find his own way home. If we're talking a matter of miles, the chance is slim, but still within the realm of possibility. For that reason, or if he's holed up nearby but afraid to come home now, it's important to prepare for him. Is the yard fenced? If so, leave a gate open enough for him to get in, 24/7. Is there a garage? Leave a door open a little, and leave food and a warm place for him ... perhaps a cardboard box on its side with plenty of bedding in it. No garage? No dog house, shed, or dog igloo? Put an adequate-sized trashcan out on its side with bedding and food in it. Live in an apartment? Let neighbors know what the can is for and ask kids to please not disturb it. When he gets back, he needs someplace to go for food, shelter, and comfort. Homing tip: Some people have found that leaving familiar and scented objects outdoors and accessible to a lost pet can be helpful in bringing them home if they are hiding in your neighborhood. For example, the bedding you provide in your outdoor shelter should be something with your odors on it such as a soiled shirt -- or perhaps a particular unwashed rug or blanket the animal has slept on while indoors which has it's own odors on it. Or you might leave a cat's scratching post out by the back door or in an accessible outbuilding. Others have also found it helpful to put other items with your lost pet's own scent on it at each door which your pet normally used, or in your accessible garage or other shelter. Home Security. Obviously, when you leave a gate or garage door or porch door ajar, you need to provide security for yourself. Install a temporary locked chain, leaving a gap wide enough for your pet to enter, if that's at all possible. Government animal pounds normally have an over-abundance of impounded cats and dogs. Through the years, it has been normal for an animal pound to adopt out fewer than 50% of impounded animals, in some cases being as little as 2%, with the majority being euthanized or surrendered for research. For annual nationwide U.S. Humane Society estimates, visit hsus.org (also see item J below). For information in your own area, use info found throughout this document on how to gather your own current statistics. Keep in mind that Humane Society of the United States (hsus.org) statistics are estimates only. Because of the complexity of the lost and surrendered pet industry, and because it is not possible to gather accurate information on numbers of strayed or abandoned pets killed on streets or dying alone in neighborhood out-buildings, information from all other sources is also estimated. The actual numbers of dead, however, are known to be exceedingly high. A few years ago, estimates were around 18,000,000 (18 million) annually in the U.S. Now, the estimates are around 6 to 8,000,000. However, since even one moderately large metro area has an estimate of 1,000,000 (1 million), it's unlikely the actual figure in the entire U.S. is as low as 8,000,000. And keep in mind that these estimates are only for stray or surrendered pets euthanized in pounds, shelters, or other facilities, plus animals who die on the streets or hidden in neighborhoods. The estimates do not include animals presented for euthanasia by their owners. Lost or stolen dogs could end up in the hands of dogfighters [for use as dogfight bait], or even Class B dealers, who sell dogs from random sources to research institutions for use in biomedical research, testing and education procedures. Beloved family pets can also become unfortunate victims of bunchers, who have been known to acquire dogs through lost, stray and "free to a good home" ads—even to take pets from their owners' backyards—and then sell them to Class B dealers. At Class B dog dealer facilities, there have been numerous documented cases of mistreatment, neglect, and other animal welfare violations. What can pet owners do to make sure that their friends and companions remain safe at home? Identify your pet with a collar and tag, microchip or tattoo. Padlock gates, and make sure people can't access your pets over fences. Keep your pet on a leash whenever you go outside. Make neighbors aware of the problem of pet theft. Know where your pets are at all times. Support the federal Pet Safety and Protection Act, now before Congress, which ensures that cats and dogs used by research facilities are obtained legally. Don't let your pet roam free in the neighborhood. Don't let your pet be visible from the street. Never leave pets unattended at any time. Never leave pets outside a store or in the car to wait for you. The chance for any pet being adopted are just that: Chance. 1. If a lost pet is running loose, the opportunity for someone to take the pet in and keep it is quite slim. The reason? Because many millions of pets are lost, abandoned, and/or turned in to pounds and shelters every year. If there were, say, three kind neighbors on any given square city block, for example, and throughout their lives, each neighbor continued to take in every stray on that block that needed help, each of those neighbors (based on numbers of animals euthanized each year) would have to take in and keep over a thousand animals, and keep those animals for their full lives. Obviously these statistics will vary greatly depending on size of municipality or metro area, with some stats being much much lower and others being much much higher. The above stats were calculated on numbers of animals euthanized or assumed deceased in alleys, roadways, etc., in an area of around 3 million people. See Section I, item H for further lost pet statistics details. 2. For those animals which end up impounded or brought to a shelter, if an animal is terrified, hostile, has other bad behaviors such as constant loud or shrill barking or meowing, is pregnant, is a female who has babies with her, is ill, injured, unsocial, matted and dirty, is intact/un-neutered, or if another undesired issue exists, adoption is not as likely. 3. If visitors are looking for a specific size, shape, color, hair type, age, behavior, etc., and your lost pet does not fit the right category, then adoption is unlikely. 4. If a particular breed, or a mixed-breed is impounded, and if that particular look is popular at the time, then the animal may have a better chance for adoption. If the breed is "out of style", then adoption may be unlikely. If there are a number of your particular pet's breed in that agency at the same time, then the chance for adoption drops again, since visitors looking for that breed or type will have a wider selection from which to choose. 5. But there are variables for some breeds. For example, sometimes there are associations for some breeds, where the association members specifically visit pounds and shelters hoping to rescue animals of that particular breed or type. Not all breeds are honored in this way. Also, since there are often pounds and shelters that associations may not be aware of (given the complexities of impoundment systems), a purebred or popular type could end up impounded and yet not be rescued by such an association. 6. If there are well-behaved "owner animals" in an agency, where information about them is readily-available such as temperament, shots and other medical history, general behaviors, etc., then even if your strayed purebred or popular type is sitting right there waiting for adoption, many potential adopters will be likely to gravitate instead to an animal with a proven background, and yours will be passed by. 7. If your lost pet is generally well-behaved, social, friendly, with an adorable personality ... that is no guarantee of adoption. Many pets change once lost and on their own; by the time he ends up in an agency cage, that once-sweet critter may be hostile, unsocial, nippy, acting wild or cowering at the back of the cage, and also may be matted, diseased, injured, or simply unkempt, making him less likely to be adopted. 8. In the U.S., vast numbers of pets, both purebred and mixed breed, are euthanized by pounds and shelters, or die on the streets, every year. If you were to line up all of these pets (we'll use the very low estimate of 8 million in the U.S. in these calculations), sitting shoulder to shoulder on the side of a road, allowing 8" per pet, you would have to drive for more than 1,000 miles before you'd pass the last to be euthanized in a year. These calculations were done awhile back. For current numbers, look up the number of animals estimated to be killed on the streets and highways (and dying in alley hiding places) in one year in the U.S. Add the number estimated to be euthanized in pounds and shelters across the U.S. in a year. Multiply that number by 8". Divide the total by 12". Divide the new total by 5,280 to determine how many miles you'd have to drive. You can do the same for your own area. Call your local Humane Society/SPCA for area-wide info. Call your city or municipality for closer-in info. Then run the numbers as above. Most pounds and shelters nowadays try very hard to be kindly to impounded animals. but there are sometimes limitations on what they can do or are allowed to do. 1. If a stray animal is ill or injured, some pounds and shelters provide immediate vet care; some transport the ill or injured to a contracted veterinary office; many do not provide vet care at all, due to the costs. Since most people do not find their lost pets (often due to not looking, not looking far enough, not doing enough, or giving up too soon), there would be no one to cover the veterinary expense. Many animal facilities are typically strapped for cash or have tight budgets; other facilities simply do not care; so if you don't show up to claim your ill or injured animal, who would step up to pay for any vet fees? 2. In facilities which do have veterinary care, you will find some which do not have "immediate" vet care, since they may not have a 24-hour staff veterinarian. In some facilities, injured or ill animals are made as comfortable as possible; in others, the animal is simply put in a cage as-is. If the animal is brought in late on Friday or at the start of a longer holiday weekend, the animal may go untreated -- no matter what the injuries -- for the entire weekend or holiday period. In some cases, the animal may be euthanized earlier, depending on staff training. In some facilities, babies too young to eat, and adult animals too ill or too badly injured to eat, will simply be left in a cage with only dry food, no hand-feeding, and no bottle feeding. These problems are becoming more rare, but do not be surprised if you see these things when you visit some pounds and shelters regularly. Note that these are not as likely to happen in Humane Societies and in no-kill shelters, but that many facilities will not allow you to visit areas where ill and injured are held so it's difficult to know for sure who does what. Providing round-the-clock vet care is extremely expensive, and simply not available to many facilities. Ill or injured pets are typically euthanized, but not always. In addition, even when ill or injured, these injured animals can still go for research. 3. How can you verify if these issues exist in facilities you visit? Sometimes you cannot. One way to get a handle on it, however: When you visit a pound or shelter which allows you to view all animals, including sick and injured, visit every day, at least once a day. When you notice an injured or ill animal, make notes as to what is wrong, what date it came in, what its ID card on the cage says, including ID or intake number, and note which cage the animal is in. Check each day to see for yourself what is happening with that particular animal. Also check other ill or injured in that facility in the same way. Over a period of time, you may get some idea as to whether this is a facility which provides immediate vet care and how quickly they might do so. Note that if you simply visit but do not take notes when visiting larger agencies, you likely will very soon lose track of what is happening, since many facilities have heavy impoundment turnover. When visiting every day, soon each black cat will look like every other to you, and each German Shepherd will look like the same one that was in the same cage the day before when in fact it may be a different dog. Intake ID numbers are crucial to doing an adequate job of keeping track, as are cage numbers. M. HUMAN ERROR. It is common for people looking for lost pets to trust what they see, hear, read, or are told. Keep an open mind during your own search, since problems are rampant. Whether you are talking with someone who has found a pet that might be yours, or talking with someone in an agency, or looking at agency records, watch out for errors. When reviewing intake lists, for example, you may find a cat on the dog list or a dog on the cat list. You may find animals listed with wrong color, wrong breed, wrong gender, wrong size, wrong location, wrong collar, wrong tags, etc. These records are kept by humans, and humans make mistakes. More on lost pets and human error in Section IV-c, item E and elsewhere throughout this report. N. PUREBRED vs MIXED BREED. Pet owners tend to believe their pet will never be euthanized by a shelter or impoundment facility and that he would never be sold for research, simply because that pet is purebred, or very expensive, or so cute or so sweet, or way smarter than most pets, or whatever. This is not reality. Read all pages of this document to understand why. and has the info you need for a successful search. Although not always true, when lost and on his own, a dog tends to roam, a cat tends to run/hide, run/hide. Keep an open mind during your lost pet search, since problems are rampant.